Officials responsible for running Norway’s Royal Palace in Oslo are starting to improve security around the home and workplace of the monarch, seven years after terrorist attacks stunned the country on July 22, 2011. Construction of new fences and other barriers to better control vehicular traffic to the palace will begin this fall. 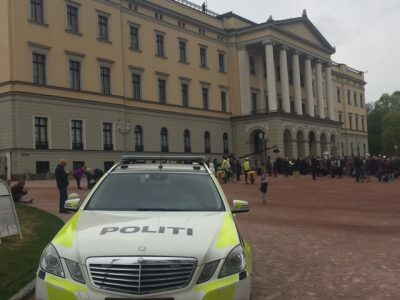 Newspaper Aftenposten reported Thursday that there’s clearly been reluctance to hinder access to the Royal Palace in a country that prides itself on having an open society. It’s currently still possible for cars or other vehicles to drive right up to building. That’s a vulnerability that allowed a right-wing Norwegian extremist to park his van, which contained a powerful bomb, next to the entrance of Norway’s nearby government headquarters in 2011. When the bomb exploded, it destroyed all surrounding government ministries, killed eight people and injured many others. Police recently have parked vehicles of their own at various driveway entrances to the palace during major public events on palace grounds, in an effort to ward off any vehicular attacks. The grounds have also been vulnerable to the types of terrorist attacks that have used vehicles to run over people in Nice, Barcelona, London and Stockholm in recent years. Steps were taken to block traffic around the Norwegian Parliament building after criticism and concern following the 2011 attacks in Oslo. The downtown area in general was deemed vulnerable to terrorist attack just last year, leading to the placement of cast-iron and concrete flower boxes up and down Karl Johans Gate. Palace officials finally realize that now the time has also come to make hindrances to vehicular traffic permanent, in the form of fences, walls and iron posts placed around the palace grounds. Asked why it has taken so long to launch concrete security measures, Frøystad all but admitted that “we chose to draw this out as long as possible.” He noted that palace staff did start addressing the palace’s lack of security right after the July 22nd attacks in 2011, that killed 77 people. A “security evaluation” was made around New Year 2012. Then the staff spent the next four years, however, considering security enhancements before an “analysis on which to base further work” was completed in December 2015. In January 2016, palace staff launched a “security project,” which involved several “preliminary projects” leading up to early summer 2017. Now work is underway on the concrete projects that finally have emerged from all the years of studying the issue. They’re expected to cost as much as NOK 592 million, with the government allocating the funding in this year’s state budget. Only vehicles will actually be affected by the looming barriers, with cyclists and pedestrians still able to freely walk through and around the palace grounds. Construction of the new fences, walls and iron posts around the palace’s perimeter won’t be finished until 2021. “We could have done this in another manner,” Frøystad acknowledged. “But we want today’s openness to continue.” He added that it’s also important to protect the park around the palace from any visual disturbance caused by the security measures. A new building aimed at handling palace logistics will also be built on what’s now a parking lot for the scores of people working at the Royal Palace. It will handle deliveries of post and other supplies to the palace, and be located next to the historic stalls and flower garden called Dronningparken. Its construction will be overseen by state building agency Statsbygg.